An extremely rare amulet, the Pra Prajam Wan Nuea Pong Sacred Powder Votive Tablet with all Eight Birthday Buddhas emblazoned on both sides of the amulet, from the Legendary Luang Por Pina, of Wat Ta Geuy (Wat Sanom Lao). The Muan Sarn Sacred Powders are made using Bailan Parchment Soot, from the early Era of Luang Por Pina, mixed with Khaw Sarn Hin petrified rice, Sacred Woods and Herbs, Pong Wised 5 Yantra Powders (Pong Bpathamang, Pong Puttakun, Pong Ittajae, Pong Trinisinghae, and Pong Maharach. These powders were then charged with Kaya Siddhi powers with the Inclusion of Nam Pi (Lek Lai related substance). The 'Nuea Pra' (Clay surface texture), is Blackish Brown, and has a very soft surface appearance despite its truly hardened texture, and has remained in Pristine Condition over the years, having been kept in an unused state. The amulet is hence highly apt for competition entry if desired, for its perfect features. 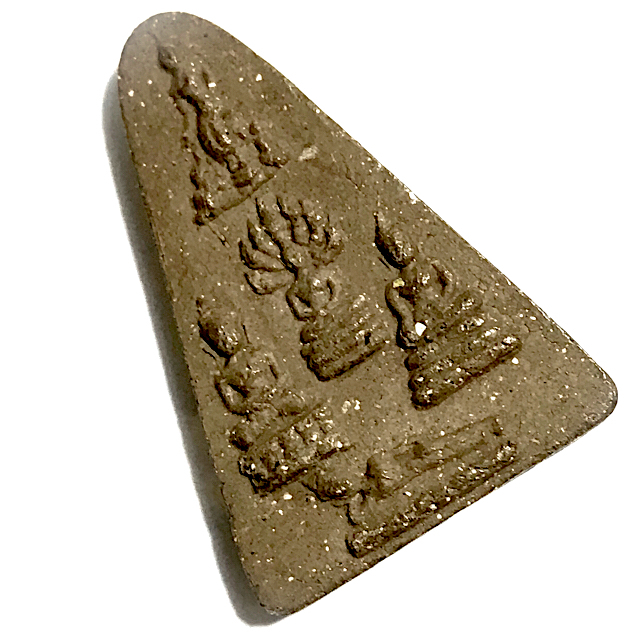 This particular amulet is a Pra Niyom preferred series of the pantheon of Luang Por Pina, of Wat Ta Geuy, and is renowned for its immense Metta Maha Sanaeh Power. In Thailand, we have a different Buddha image for each day a person is born on. You will see these Buddhas normally in Thai Temples with an alms bowl in front of them lined up in a row. This is for you to donate the allocated amount for each Birthday (the amount is different depending on which day you were born on. There is one Buddha for each Birthday, with the exception of those born on Wednesdays, which has two Buddhas; one for the daytime and one for the night time, so you should know whether you were born in the daytime or evening to revere Wednesday's Buddha. Luang Por Pina is the deceased Abbot of Wat Sanom Lao in Sra Buri and was said to have possessed Abhinya Powers, and to have Mastered the 10 Kasina Powers of Elemental Magical Dominion. He died seated in Meditation. It is said that he was able to read the minds and intentions of other Humans, and bring amulets to life with is Empowerment Methods, and that his amulets were able to give signs and also can be beseeched and prayed to for wish fulfilment (Sarapat Neuk). There are many stories of Miraculous Events occurring through his amulets. This amulet is a powerful tool not only to increase your Fortunes and Improve your karma in a worldly sense, but can be used for 'Buddhanussati' (remembrance of practice and the triple gem), as a contemplative focal point of self transformation and empowerment of manifest Buddhist Kammathana Meditative Practice. It points to the path towards enlightenment, and can assist you in walking the path, if this is your intention, and leads far above and beyond simple worldly desires. A study of the meanings of the different 'Birthday Buddhas' which depict scenes from the Buddha's life, can serve as a reminder of the perfections we must develop and master to become Buddhas ourselves. Luang Por Pina was most famous for his Mae Nuea Horm, Daw Nai Pon Nai Pan Star amulets, Palad Khik Hua Chamot, and his Duang Ta Arahant (Pra Putta Jao) amulets. His amulets are amongst the most highly preferred, for it is known that Luang Por Pina would always be personally involved in the pressing of the amulets with his own hand, and only ever had a very few close apprentices to help him, which means that all the amulets of lp Pina have passed through his hand. If you listen to the above three quarter of an hour short Biography of Luang Por Pina, recounted and narrated by Amulet Expert Ajarn Spencer Littlewood in the below Podcast, You will be amazed to learn about the very deep meanings contained within the amulets of Luang Por Pina, and for those of you who are devoted Buddhists and Practitioners of Dhamma, you will feel incredibly inspired to use Buddhist amulets to increase your awareness of the practice of Dhamma, Meditation and Vipassana. 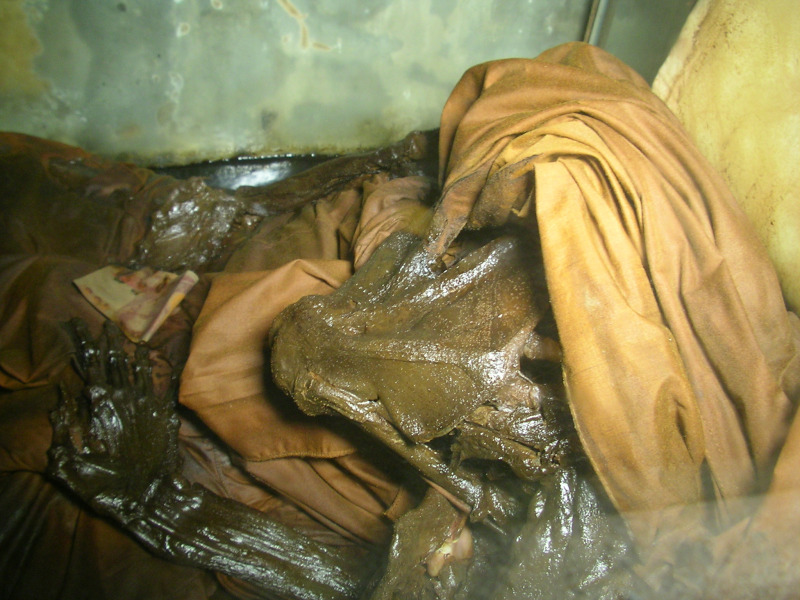 The corpse of Luang Por Pina was found in meditation posture in the year 2545 BE on 15th October, dead since over 12 Hours, but was still warm, and not stiff, to the immense surprise of those who found him. The surprise was because a corpse that is dead for over 12 hours, should be stiff as a board and cold.. his body was not mummified or given any special treatment according to his wishes and placed in his mausoleum.